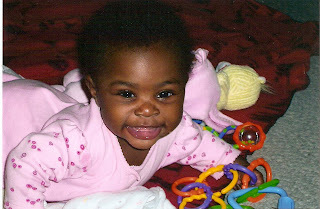 I am really loving going through Asha's photo albums and picking out pictures to post. 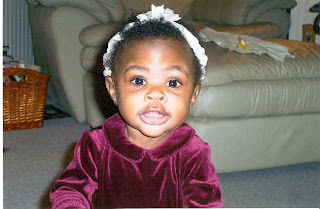 She was just so darn cute and I even watched one of her videos from when she as a baby today and she was hilarious. 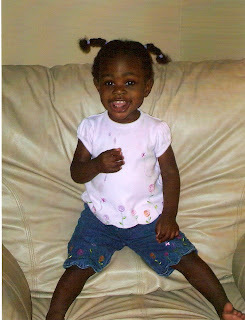 She has always had this infectious laugh that comes right from her belly. She just makes you smile and she is always such a happy little girl. I could not have asked for a better daughter. Here is Asha in the spring a few months after her first birthday. Here she is in the summer. She just changes and grows so fast and so much. Here she is in the fall/winter. She just thinned out and grew so much. Her photo album is like a flip book you can just see her growing. Just thought I would share these few photos. I still can't believe it's been 3 years already. We celebrated Asha's birthday tonight and she had a GREAT time. She loved her cake which I had done at the local grocery store. They did a really good job and it turned out really cute. She wanted her cake before presents so she was very excited about her birthday cake. It was just a family party and that's the way Asha likes it. She loves her family and any time she gets to spend with us all together just makes her day. Here's her Barbie cake she picked out. She was so proud of her cake!! This is the big present her dad and I pitched in to get her. It's called a rainy day combo from the One Step Ahead catalog and it's a combination trapeze bar and swing for inside. It hangs from the doorway. Here's a picture of the big present. She absolutely loved it. She used the swing more than the trapeze bar but I'm sure the bar will get plenty of use as well. She really did have a great birthday and didn't want it to end. She was up until almost 10 p.m. playing with all of her new toys and just loving it. It's a good thing it's the weekend because I think she'll want plenty of time to play with all of her new things. 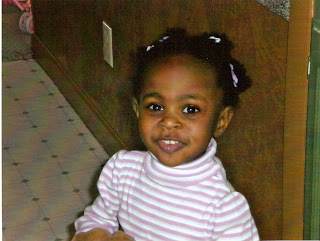 I thought I would post some pictures of baby Asha. I didn't start this blog until she was already older so you never really got to see how cute she was and how small she was as a baby. 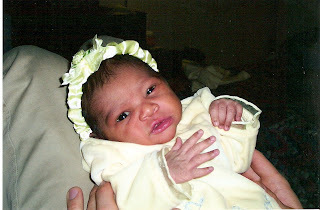 This is right after we got her from the hospital. We are in our hotel room just adoring her. The outfit she is wearing is a preemie and she was so tiny in it. 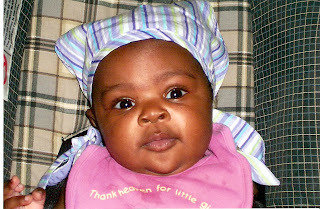 This picture is probably in June or July so only a few months after she was born and she really chunked out. She doubled her weight in 2 months instead of the normal 4 months. Those cheeks got kissed ALOT!! Once she started to move around more on her own she started to thin out but she is just as cute as ever!! I loved her toothless smile. I absolutely love this picture of her. I think it was probably taken in October or November. She just grew so fast. I will also post her second year pictures some time this weekend. I just can't believe how fast the last 3 years has gone by. I can still remember holding this little itty bitty baby and now I can't get her to hold still long enough most days to hold her. I love her so much and she has been such a blessing in my life!!! Asha is 3 today. I can't believe that it's been 3 years already since we got the call that she was born. She was so tiny that her carseat looked like it swallowed her up. We had to buy preemie clothes for her and they were still too big. We called her our little Florida Peanut because she was just so small and would tuck her legs up which made her look even smaller. We had a wonderful day. We went to visit this amazing day care center and she didn't even want to leave which is good since she may be going there starting Monday. Then we picked up her grandma and aunt so they could do lunch at McDonalds with us and then we got Asha her fish. She picked out the most expensive Betta fish there but it's really pretty. He is blue with beautiful fanned out tail/fins and she named him "Nemo". We saw some Nemo fish there that were REALLY expensive and she really wanted them so she named her fish Nemo instead of getting the actual thing. She is sleeping now on the couch from her busy birthday day. We are going to have her favorite pizza for supper and then her birthday party is tomorrow so I will post pictures then. I got her the cutest birthday outfit. The time just goes so darn fast. Hope everyone had a Happy Easter. I had kind of a mellow day. I went to church for 10:30 and it was a really nice service. Some of the members played a beautiful song on their violins. It was a little hard though because everyone asked where Asha and my husband were so I did end up telling more people about the divorce. Not alot of people in my town know yet. I was fine though. I didn't cry or even feel sad about it at all. I did miss Asha and wished she was there with me but a few hours later I got to do and pick her up. Every place we wanted to eat was closed so we ended up finding an IHOP that was open. I met the girlfriend but we didn't talk much. Josh told me about Asha's weekend and I don't have any pictures of her dressed up because starting Saturday she ended up with the runs and ruined every outfit I had packed for her. It was either from the stress of being away from me (they said she asked for me all weekend) or from all the junk he fed her. I felt so bad that my girl was sick and I wasn't there to help her. I did get a few pictures of her opening her Easter basket/carton here. I found these cute little cartons that I used instead of baskets because the kids really don't need all that candy. Her favorite thing was the bunny stuffed animal I got her and a little wind up hopping bunny. Here she is digging all the goodies out of her Easter carton. She was pretty excited by that. This one's just because I thought it was cute. I love those Minnie Mouse ears on her. Well I hope everyone had a wonderful Easter. Ours wasn't anything spectacular but as long as I get to spend it with Asha I am happy. Asha is with her dad this weekend but we are meeting up about an hour from my house to have Easter dinner together at a restaurant. I get to meet his girlfriend today. I'm not really nervous about it at all because I feel sorry for her. All I want is for her to be someone who is good enough to be around my daughter. I don't really have hard feelings about her even though she is part of the reason I am getting divorced. I am happy I'm getting divorced now. I have this wonderful feeling of happiness that I have never felt in my whole entire life. This is the place I have been trying to get to for probably 20 years. It is an amazing feeling and I wish that everyone could be this happy. I will let you all know how Easter dinner went. I miss my girl terribly but I did get alot done around here yesterday which took my mind off of her. I will try to get some pictures of her all dressed up for Easter to post. Also her birthday is on Thursday and I got her the cutest outfit. I will post birthday pictures next weekend. I have a couple of big days planned for her. Happy Easter and I wish everyone the light and happy feeling I have!! Those that I tagged can participate if you want. It was so amazing to be able to see Asha's birthfamily again. There was Mamma D, Asha's sister who just turned 6 and her brother who is 7 1/2. It was like they had never been apart. 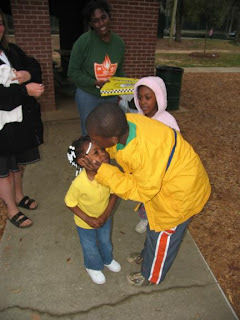 Asha's brother walked up to her and grabbed her little face and planted a kiss on her forehead. He saw her a few years ago when they came for a visit but her sister hadn't seen her since she was a baby. Asha's sister was very taken with her and followed her all over and we got some great pictures of the girls together. By the time we got to the park it was already getting dark so I didn't get alot of pictures of Asha with Mamma D and the ones I did get are dark. Plus Asha was being a tease and would come like she was going to take a picture with Mamma D and then she would run away laughing. It was so sweet when we got there Asha wanted to swing so Mamma D pushed her for probably 15 minutes on the swing and when Asha's sister wanted to push Mamma D told her that there were things adults had to do and she just had to keep pushing Asha. It was so great to see them together. Asha would call her Mamma D and Mamma D would just beam. I don't think she stopped smiling the whole time we were there. There is this cute little song I made up when Asha was little Asha D baby D Asha D my baby girl well Asha sang it to them that way and then she sang it Mamma D baby D Mamma D my baby girl. It was so darn cute and we all cracked up laughing. We only got to spend a few hours together but it was worth it. This was right when we got to the park. We met Asha's birthfamily there and the kids just kind of attacked her. It was so great to watch them. My friend took this one and when she sent it to me I almost melted. It is the sweetest picture ever. A family meal together. It was hard to get the kids to pose for pictures when there was pizza present so we just took every opportunity to get them together so ignore the pizza and look at the beautiful family. 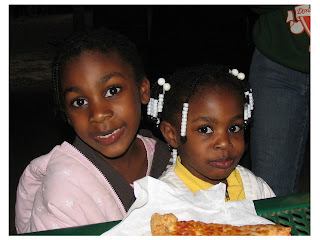 Asha and her sister. My friend Deb couldn't believe how much Asha looked like her sister. Asha's sister and Mamma D. It was much easier to get pictures of Mamma D and Asha's sister together because her brother was always off playing. I do have more pictures but they are so dark. I need to work on making them lighter. I am just so happy that I got the ones that I got. I can't wait to print them and frame them in Asha's room. We are so lucky that we got to spend time with them and that Asha got to see them again. We had the best time in Florida. It was the best vacation I have ever taken and I've taken alot. It was so relaxing and it was so nice to be able to enjoy Asha having so much fun. I was so worried that I would never be able to afford to take her someplace like Disney World so I owe ALOT to my wonderful friend Deb who took us with her. She was so amazing to ask us to go and then to make a special stop on the way home so Asha could see her birthfamily was above and beyond. I am so blessed to have such a wonderful friend. Our resort was wonderful and had multiple pools, a kiddy pool and an area where the water would shoot up from the ground and the kids could run through it. Asha's not real big on water but she really had fun in the kiddy pool and in the water spouts. 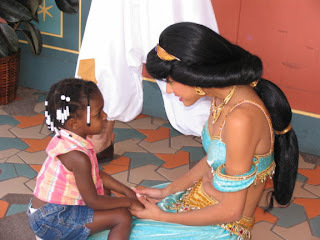 Disney World was amazing and Asha had so much fun meeting all the characters. I was worried she wouldn't want to go by them but she sat and had her picture taken with everyone we met. I bought her an autograph book that has a space for the picture you take next to the autograph so I can't wait to get the pictures developed. She almost filled the whole book with autographs. She went on alot of rides and did great on all of them and we just had an amazing vacation. She held up really well with all the driving we did and even with all the standing in line for rides and autographs. I am so happy we went and I will definately remember it forever. It truly was one of the BEST vacations I have ever taken. I've never been able to relax on vacation so it was such a nice thing to be able to do. Ok here are the pictures I'm sure you are all waiting for. 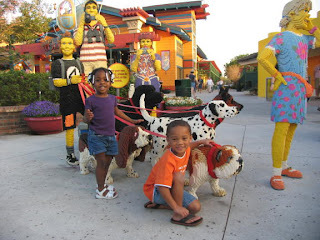 This statue was at Downtown Disney in front of one of the gift stores. I figured if she wouldn't stand in front of the real Aurora then atleast I would have this picture. This was also at Downtown Disney. They had a whole area where things were made out of legos and the kids could play with legos. If you look closely this whole family is made out of legos. Here is Asha and Jasmine. Asha was so shy but it was so cute to see her with Jasmine. It took us an hour and a half to see Minnie. It was the longest wait we had but atleast we got to go through Minnie's house on the way to see Minnie. Here is Asha standing in front of Minnie's fireplace. It was really neat and interactive in Minnie's house. A nice couple offered to take a picture of me and Asha while waiting for our friends to get off of a ride. Asha is eating popcorn. She ate a whole bucket of popcorn by herself. This is my absolute favorite picture of Asha. This was at the resort after we got done swimming and it just turned out so darn cute!! Asha absolutely loved these Minnie ears. Dakota gave me some money to buy something for Asha from him so I got her these ears from brother. She has not really taken them off since she got them. This is Caleb and Asha. 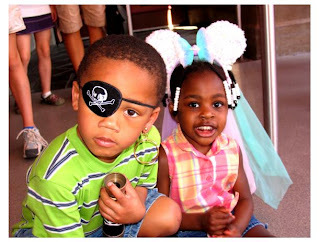 The pirate and the princess. He was trying to be mean looking like a pirate. They are just so darn cute together. 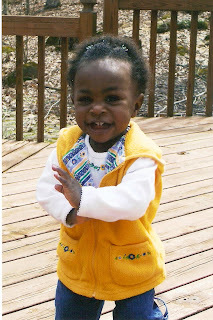 I am going to do a seperate post of our visit with Asha's birthfamily and those pictures. I really wish we could have spent more time with them but I am so greatful for the few hours we did have. It was so wonderful to see Asha with her birthfamily. It was like they have always been around eachother it was just so natural for all of them. Here are a few pictures I've taken of Asha this week. I've been pretty busy with packing and organizing for the Florida trip so I haven't been taking too many. Trying to save memory and battery life for Florida. I will get LOTS of pictures there to share with all of you. Ok blogger won't let me add pictures right now so I will do it later. Someone on a previous post had commented about Asha's hair and who taught me. No one taught me I just joined some yahoo adoption groups of other people who had AA children and looked at their pictures and went from there. I also get ideas from tv and I just practice and practice on her little head until it looks like it should. There are also a few websites that show you how to do some stuff. I will post the websites on her at a later time. I need to get going otherwise I would do it right now. When I post the pictures later I will post the websites. I finally got blogger to work. This is Asha's latest hairstyle. I just love her with bangs but unfortunately her hair is getting too long to do it much longer. It doesn't seem to bother her much though. She loves her sunglasses and usually wears them one of 3 ways. Either on her chin, on her forehead or upside down but very rarely the right way. Hope everyone has a GREAT week and I will post Florida pictures when I get home!! Happy Birthday To Me & I'm Sorry!! Sorry for the bummer post last Friday. I was feeling lonely but I am back to being happy. I just have my moments and it helps to blog about it. I actually feel VERY blessed. I wasn't expecting my birthday to be much of anything this year since my husband was the one to always do something for me but it is turning out to be a really good few days. My birthday is on Saturday but Friday I am taking my stepson Dakota and Asha out to eat with me to my favorite Chinese restaurant with birthday cake after at my in-laws house plus I have a job interview that day. Then on Saturday on my actual birthday I am going to meet up with the friend that we are going to Florida with and she got us tickets to the play her husband is in and we are going out to eat prior to the play and then OF COURSE don't forget that I get to spend a week in Florida!!!!!!! This is looking to be my best birthday EVER!! So when I get down and do posts like I did on Friday it's just a moment I'm having and thankfully I can get back to being happy and enjoying Asha because I really am blessed!! !